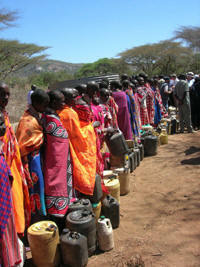 Women que for water. Amina Abdalla, a 45-year-old mother of seven, lives in northern Kenya’s Marsabit District, where life is a daily struggle for scarce water and pasture. Abdalla’s family lives on about 10 litres (≈ 1 quart) of water per day, far below the 20-50 litres per person per day recommended by the UN. Amina Abdalla, a 45-year-old mother of seven, lives in northern Kenya’s Marsabit District, where life is a daily struggle for scarce water and pasture.